I’m always on the look out for creative ways to share the gospel. This past weekend I was in Singapore speaking at a Reformation Day Conference. This conference was organized by the First Evangelical Reformed Church of Singapore. One of the elders of the church was driving me back to my accommodations on Sunday evening and we were chatting about all kinds of different things. As we pulled up to the housing complex, this retired man casually mentioned something he does with his time during the week: he’s an Uber driver. If you’re not familiar with it, Uber is a popular ride-sharing service. Uber offers an app that connects people who want rides with people who can provide rides. This brother uses Uber as an opportunity to share the gospel with strangers. He keeps a supply of evangelistic tracts in his car and hands them out to whoever it is that he picks up. While he’s driving, he often engages in conversations with his passengers and sometimes those conversations lead to the gospel. He’ll also be listening to sermons or Christian music as he drives. This is a great example of using the opportunities God gives to spread the good news of Christ! A New Sister for the FRCA! Our consistory here in Launceston received word the other day that the First Evangelical Reformed Church of Singapore has accepted the offer of sister church relations with the Free Reformed Churches of Australia. I’m thankful to hear this news — I had the privilege of visiting this church in 2012 and I was appreciative of their faithfulness and eagerness to hold forth the gospel in that corner of the world. One interesting thing about this development is that, up till now, virtually* every sister-church relationship of the FRCA was held in common with the Canadian Reformed Churches. The Canadian Reformed Churches don’t have ecclesiastical fellowship with the church in Singapore, but now the FRCA do. *”Virtually” needs some qualification/explanation: there is a complicated situation with the Reformed Churches of Indonesia. From what I can tell, the FRCA have a sister-church relationship with the entire RCI. However, the CanRC only have ecclesiastical fellowship with the RCI in the province of Timor. Today let’s briefly survey what happened at the Synod of Free Reformed Churches on Thursday. I’m drawing on the approved draft copy of the Acts which can be found here. There were extensive discussions about the Reformed Churches in the Netherlands (Liberated) and the Book of Praise, but no decisions on these. There was, however, another significant decision in the area of ecumenical relations. 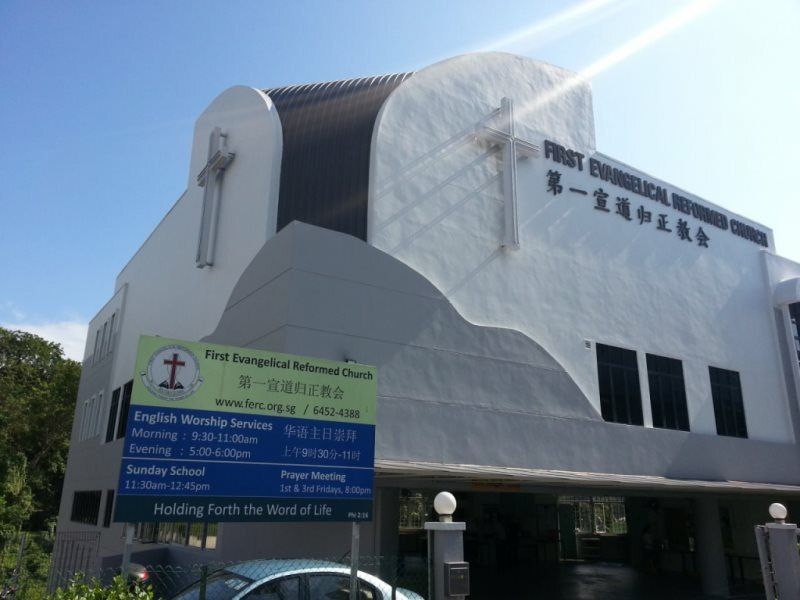 There is a Reformed church in Singapore known as the First Evangelical Reformed Church (FERC). A few years ago, I was privileged to visit this church and speak for a Reformation conference there. The pastor of this church, Nam Tuck Chong, studied for a year at our seminary here in Hamilton and was a member of Providence CanRC, the church I currently serve. The Synod decided on Thursday to extend the offer of a sister church relationship to FERC. It only remains for FERC to accept and then this relationship comes into effect. Since it is just a single church and not a federation, that decision should not be long in happening. That’s wonderful news, in my view. Should you ever find yourself in beautiful Singapore on a Lord’s Day, I highly recommend this church as a faithful body of Christ!